From the startup screen, you have to choose a search method: Internet or local search and a dictionary: English, French or German. 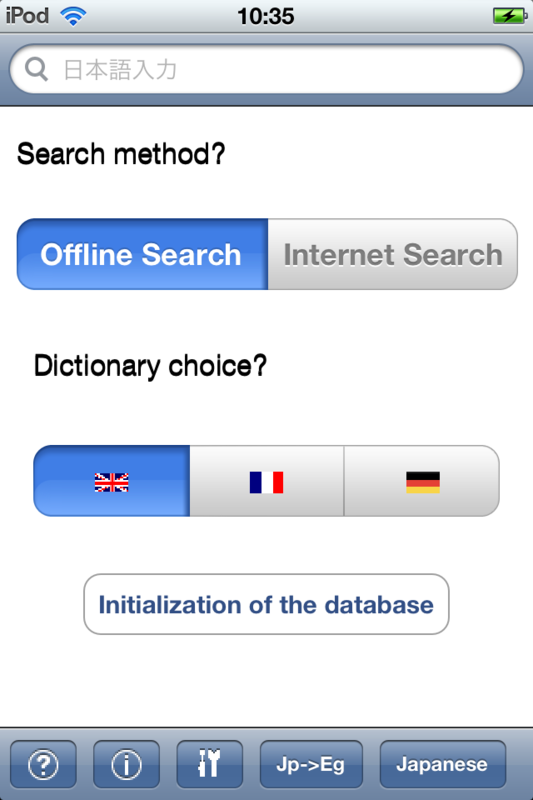 If you want to use the local search, you have to initialize the database by downloading the associated dictionary through Internet (once for each language). If you have an Internet connection, you can take advantages of Internet search: faster reponse, picture gallery, google map etc. If you don't have an Internet connection, you can still continue to use our dictionary, as long as the database has been initialized beforehand. Connecting to Itunes Store from a browser or launching App Store with your iPhone and search the program by typing keyword "eurojapan". When the Internet access is necessary? Always for Internet search mode, once during a database initialization for local search mode. Do those 2 modes give the same results? Yes, they come from the same database excepting for some cosmetic differences: Internet search mode shows organic relations between words and characters. How to change the default translation language? By changing the default setting of your phone. Concretely, go to Home/Settings/General/International/Language/, then choose between English, French or German. How to know when the database on sever has been updated? Please follow me by clicking a tweet button at the top of this page. 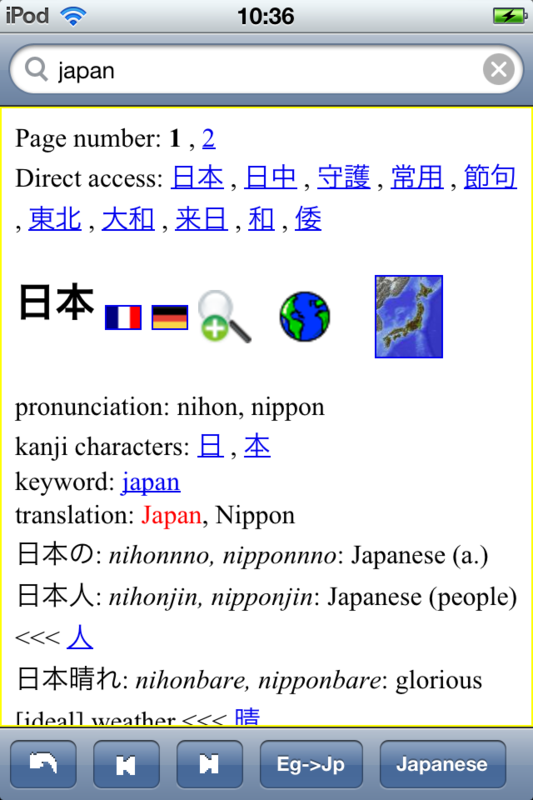 Euro-Japan dictionary for Android is also available at Android Market. This is the first release of Euro-Japan dictionary. This update corrects some minor bugs such as wrong Kana to Romaji conversions. It excludes also words between parentheses during searches. You may also need to download a new database, if it is about an upgrade by clicking "initialization of the database" button, for it contains hundreds of words more with many corrections. From this update, you can no more type Japanese characters when English to Japanese translation is chosen. The program also improves the ranking algorithm when a search has found several words, especially in English to Japanese translation. You may also need to download a new database to enjoy the new ranking algorithm, by clicking "initialization of the database" button, if it is about an upgrade. 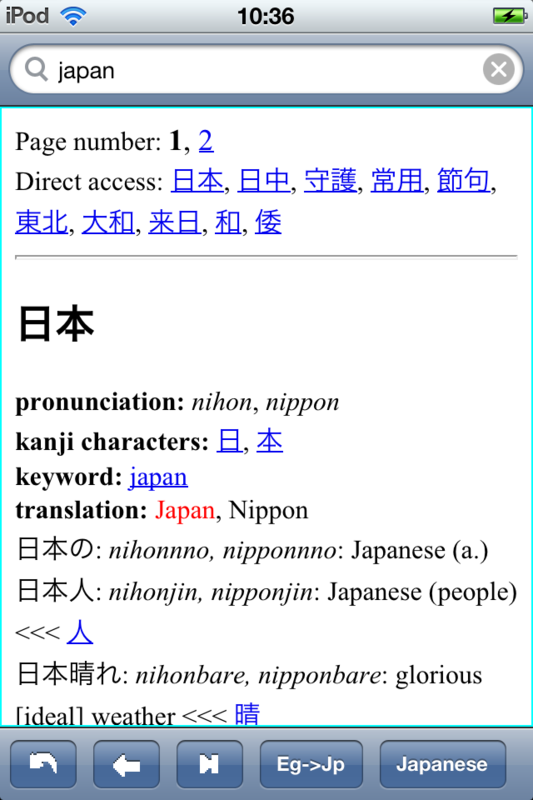 The last version allows adding more information on the words found during an offline search, such as synonyms, antonyms and Kanji characters used. This is an option activatable from the "Options" menu but recommendable only for the last generation of phones with a fast processor and enough memory. You may also need to download a new version of the database by initializing it, if it is about an upgrade. The last version allows adding cross-references between the words found during an offline search. This is an option activatable from the "Options" menu but recommendable only for the last generation of phones with a fast processor and enough memory. You can also save your preferred settings such as starting dictionary (English, French or German) and display mode (Japanese or one of aforementioned European languages) by the command “Home/Settings/EuroJapan”. The last version allows retrieving previous search results by one of the toolbar buttons at the bottom of screen (limited by memory size in online searches and 10 results in offline searches). By the way, you can always come back directly to the initial page by far left button. You may also need to download a new version of the database by initializing it, if it is about an upgrade. The last version allows retrieving previous search results by back and forth buttons (limited by memory size in online searches, and 10 results in offline searches). They change the form when no results are available and force to return back to the initial screen if you continue to tap. The last version also updates correctly the search box and translation direction when you go and back in the saved results.